Brandon Rios (33-2-1, 24 KOs) came into last night’s fight against Mike Alvarado (34-4, 23 KOs) with his career essentially on the brink of collapse after losses to Manny Pacquiao, Alvarado and question wins over Richard Abril and Diego Chaves. But with his 3rd round stoppage win over a near-frozen Alvarado, Rios’ career has been rejuvenated, at least temporarily. Rios’ promoter Bob Arum is so excited about his win last night that he’s talking about the 28-year-old Rios getting nothing but big fights from here on out. “It’s up to him [Rios]. We’re going to talk. Obviously he’s only going to fight in big matches because he’s one of the big-time fighters that we have around, so we’re going to get the biggest possible fight for him,” Arum said via Fighthype. You’d like to have seen Rios in with a better opponent than Alvarado in order to get excited about him. He had the perfect fighter for him to shine against with Alvarado, but it’s very questionable if Rios would have been able to look this good against someone that was actually throwing punches back at him instead of just taking them like Alvarado was. It would have been a different story if Rios was getting nailed to the head with hooks by someone like Keith Thurman, Shawn Porter, Lucas Matthysse, or even Amir Khan. It’s likely that Arum is talking about wanting to match Rios against the likes of Tim Bradley, Chris Algieri, Ruslan Provodnikov and Victor Ortiz in terms of him being involved in big fights. However, it wouldn’t be surprising if Arum puts Rios back in with his star fighter Pacquiao in the near future within two or three fights, because Arum likes to put together in house fights involving his Top Rank fighters, and he tends to do a lot of rematches. We’ve seen Pacquiao fight Juan Manuel Marquez 4 times, Erik Morales three times, and Marco Antonio Barrera twice. If Rios picks up a couple more wins, we could easily see him back in with Pacquiao. 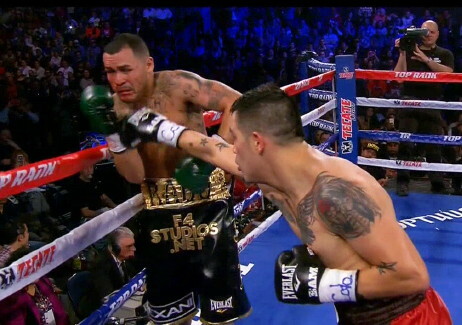 Rios definitely looked good last night in beating Alvarado in front of his own fans at the 1stBank Center, in Broomfield, Colorado, USA. The crowd hated the way the fight ended with Alvarado being stopped on his stool after the 3rd round, but it was a wise move for him not to continue if he really couldn’t see out of his left eye as he spoke about because he would have likely been knocked out in the 4th if he had come out for that round.